Mark Hughes, Contributor – I write about films, especially superhero films, & Hollywood. We are on the cusp of monumental changes to the way we think about and experience entertainment, as augmented reality and virtual reality continue to evolve and bring new opportunities for experiencing storytelling and gaming. I’ve written about this topic several times, and moderated a panel at SXSW a couple of years ago about the future of VR, but a few weeks ago I participated in something that has once again changed how I think about VR and the potential for crossover with various mediums and storytelling formats. 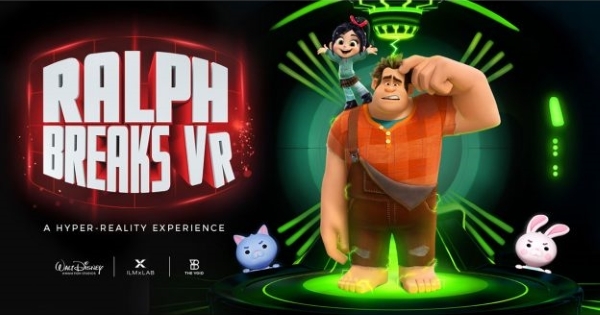 The VOID and ILMxLAB developed the new virtual reality experience titled Ralph Breaks VR, to coincide with the release of Disney’s animated blockbuster sequel Wreck-It-Ralph 2: Ralph Breaks the Internet, and what they’ve accomplished is a transcendent, game-changing virtual reality experience that is on the cutting edge of the next stage in VR evolution. There are several crucial questions about mainstreaming VR and getting the public to think about VR outside of limited gaming experiences. One of the biggest challenges has been the hardware itself, since to date there’s no standardization and everyone is racing to develop their own next-stage equipment without even agreeing on fundamentals for either hardware or software. There’s also been a relative dearth of available content for any given system/hardware. Then there’s the fact the hardware has tended to be heavy and necessarily tethers users to a limited space via wires and chords. Finally, there’s the related question of how to expand the environment of VR to take advantage of both the storytelling and movement potential in ways that defy hardware and software limitations. The VOID is cracking the code on all of these issues. Wireless VR in a large and changing environment that allows extensive range of movement and travel within a virtual world based on popular brands that merges the storytelling of the IP with immersive gameplay and even teamwork — that’s what The VOID has achieved in this latest Ralph Breaks VR experience, and it’s every bit as jaw-droppingly impressive as it sounds. Let me quickly explain what happens when you enter Ralph Breaks VR. You’ll don a lightweight helmet with a large visor, which provides a wide and clear field of vision within the virtual world. This helmet is nonintrusive, fits comfortably and isn’t heavy on your head, and it has no wires or chords limiting your movement — it’s all wireless, folks. You also don a vest, which is even lighter weight than the helmet and fits like a life preserver with snaps in the front. The vest allows greater motion capture so when you look at yourself in the virtual world, and more accurate positioning within that world as you move around. When I say “move around,” I don’t mean within a small space, or even within a single room. You’re going to don your helmet, watch an entire virtual cartoon world appear around you, and then you’ll walk and travel through this large world in a way that exceeds anything you’ve experienced or expected so far in VR. I walked through buildings, along catwalks, jumped onto flying ships that took me flying over and through an awesome cartoon city, and fought off all manner of animated characters with my pancake-and-milkshake launcher. Oh, did I mention that when you go into a room and need to grab a pancake-and-milkshake launcher off the wall, you reach out and literally grab one in your hands and it’s really there — this is after you’ve been walking through the rooms and halls and catwalks, mind you. Likewise, when I was on a balcony looking out over the city, I decided to reach out and touch the railing to see what it felt like in “real life” and was shocked to discover I was physically holding an actual rail. The sense of scope and space within Ralph Breaks VR is simply unparalleled in any VR I’ve experienced to date. Any VR experience can leave you initially a bit unsettled if you try to move too fast, because you fear you might accidentally bump into something in “real life” that you can’t see in the virtual setting, or that what appears to be an open smooth path could have bumps or uneven surfaces causing you to trip. There’s also often a degree of motion sickness that some users feel when they move around within a virtual world. None of this, however, applies to The VOID’s creation. Within the first few minutes, it quickly became apparent that the cartoon world around me could be navigated fast and smoothly without hesitating or constricting my movements to avoid bumping into or tripping over things. And the fluidity of the virtual imagery plus the consistency with which it aligned with what I felt and how I moved around prevented any motion sickness. Which brings up a major point about what makes Ralph Breaks VR so perfect — the animation is smooth, clear, and like watching an actual Disney movie play out around you. There’s a realistic sense of depth and solidity to the images and world of the experience, so it’s easy to be so drawn into it that you actually sort of forget none of it is “real.” That’s not to say you don’t realize you’re living inside a cartoon, and that you have personally become a cartoon character too; rather, your brain just accepts the environment around you and you interact with it as you would a real-life environment. The quality of all of the location-based virtual reality tech is thanks to a partnership between The VOID and ILMxLAB’s technology that lets you exist within VR experiences in ways previously impossible to imagine. What they’ve achieved here is brilliant and should make everyone rethinking the ways we write and experience storytelling. What Ralph Breaks VR has done is more than just what literally exists in this experience itself. They’ve provided proof-of-concept for potential open-world VR with actual world-building and stories that allow wider arrays of choice and immersion. I can’t go into precise details about the physical setup, but what The VOID and ILMxLAB have created is applicable to easy modifications that will further expand the size and scope of the physical setting and thus allow hypothetically endless virtual environments. And that means you’re ability to step into the worlds of your favorite movies, TV shows, books, games, and other environments will continue to grow — expect to eventually see these VR experiences in every theater, mall, arcade, and (eventually) right in your living room once the hardware improves. Using this technology, it is also quite easy to see how we get from here to a point where you can enter a virtual world for the cinema experience itself. Soon, there will be movies in which each viewing of the same film provides a different perspective and vantage point, thus different subtext and knowledge of events, depending on how you wish to experience the story. You can be as passive or as influential as you wish to be in a given story, in other words. This won’t be ideal for every movie, of course, but some will come to utilize it, and once audiences realize the potential it will become increasingly popular. Ralph Breaks VR is an incredible, game-changing VR experience that you will instantly fall in love with, whether you’re a gamer or just an average filmgoer with no prior exposure to virtual reality. It’s big, it’s bold, and it’s the next stage of possibility for virtual reality and storytelling. Ralph Breaks VR is at select VOID Experience Centers nationwide, so trust me — find one near you and dive in.